At the 2010 Paris Motor Show, Stefan Jacoby confirmed plans for the company's launch of a plug-in hybrid in 2012 and noted that the foundation for the hybrid would be the V60 model. The V60 plug-in hybrid will have carbon dioxide (CO2) emissions of just 49 g/km and the car will be equipped with a battery that can be recharged in between 4-6 hours and provide up to 50 kilometres in pure electric range. Volvo Cars is readying a world first for Geneva. The Swedish firm will be unveiling what it claims is the world's first diesel plug-in hybrid, with carbon dioxide emissions of 49g/km. The car is a modified version of the Volvo V60, and will be shown in near-production form ahead of going on sale in 2012. The front wheels of the V60 Plug-in Hybrid are driven by a five-cylinder 2.4-litre diesel engine, which produces 215bhp and is connected to a six-speed automatic gearbox. The rear axle is powered by a 70bhp electric motor, which receives its power from a 12 kWh lithium-ion battery pack. The driver can choose from three different modes, depending on the type of driving being undertaken. Pure mode is fully electric, with a range of up to 32 miles; the default Hybrid mode returns the 49g/km carbon dioxide figure and 746-mile range, and Power uses the combined engine and electric drive to deliver 285bhp and a 0-62mph time of 6.9 seconds. The V60’s rear-mounted batteries can be recharged using a household plug, which takes around five hours. When charging from the mains, the car’s cabin can be preheated or cooled, either via an on-board timer or mobile phone app, saving precious fuel. Volvo will confirm the price of the V60 hybrid closer to launch. Although it will be more expensive than a conventional V60, which starts at £23,145, Volvo claims that the fuel costs will be one-third of the regular car. Volvo Car Corporation is now taking the next step in the company's electrification strategy by producing test cars with Range Extenders - electric cars that are fitted with a combustion engine to increase their effective range. The projects, supported by the Swedish Energy Agency and the EU, encompass three potential technology combinations. Tests of the various concepts will get under way in the first quarter of 2012. "This is an exciting expansion of our increasing focus on electrification. Battery cost and size mean that all-electric cars still have a relatively limited operating range. With the Range Extender, the electric car has its effective range increased by a thousand kilometres - yet with carbon dioxide emissions below or way below 50 g/km," says Derek Crabb, Vice President Powertrain Engineering at the Volvo Car Corporation. The company's technological developments in this area currently encompass three different technology combinations, with three-cylinder petrol engines being installed to complement electric drive to the front wheels. All the variants feature brake energy regeneration. The engines can run on both petrol and ethanol (E85). Two of the solutions are based on the Volvo C30 Electric. In both cases, the standard battery pack has been somewhat reduced in size to make room for the combustion engine and its fuel tank. This is based on a C30 Electric with a three-cylinder combustion engine producing 60 horsepower (45 kW) installed under the rear load compartment floor. The car also has a 40 litre fuel tank. The combustion engine is connected to a 40 kW generator. The power it generates is used primarily to drive the car's 111 horsepower (82 kW) electric motor, but the driver can also choose to let the generator charge the battery, thus increasing the car's operating range on electricity. The Range Extender increases the electric car's range by up to 1,000 km - on top of the 110 km range provided by the car's battery pack. Here the car gets a more powerful three-cylinder combustion engine at the rear and a 40 litre fuel tank. The difference between this and the first solution is the parallel connection, whereby the turbocharged 190 horsepower engine primarily drives the rear wheels via a six-speed automatic transmission. This gives a better fuel efficiency rating when driving with the combustion engine cruising on the highway. Via a 40kW generator the battery can also be charged to give the car increased range on electricity alone. Here too the electric motor is a 111 hp (82 kW) unit. The two power sources give the car more than 300 hp in total, and acceleration from 0-100 km/h of less than six seconds. The Range Extender increases the electric car's range by more than 1,000 km - in addition to the range of up to 75 km provided by the car's battery pack. This is a solution whereby the entire drive package is installed under the bonnet at the front. The 111 hp (80 kW) electric motor is supplemented with a three-cylinder petrol turbo engine producing 190 hp (140 kW), a two-stage automatic transmission and a 40 kW generator. Power from the combustion engine drives the front wheels via the gearbox and recharges the battery pack whenever needed. 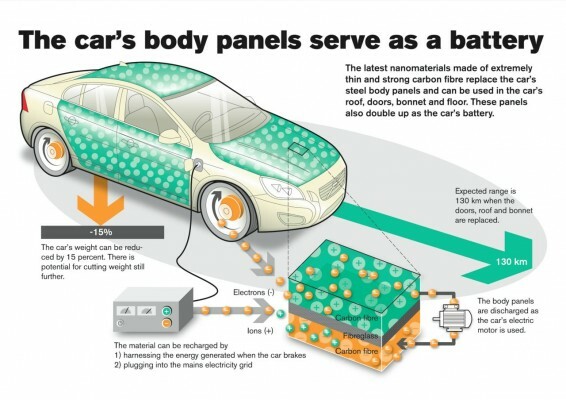 Up to 50 km/h, the car is always powered solely by electricity. The combustion engine is activated at higher speeds. What is more, it charges the battery pack when its charge drops below a predetermined level. The battery pack is located under the rear load floor and it gives the driver a range of 50 km on electricity alone. The car also has a 45 litre tank for petrol or E85. With this technology, the Range Extender increases the car's total range by more than 1,000 kilometres. The series-hybrid Range Extender in the C30 is part of an EU project in which the Volvo Car Corporation is the only car manufacturer among eight partners. The company's two parallel-hybrid Range Extender solutions are being developed with a grant of SEK 10.8 million (EUR 1.2 million) from the Swedish Energy Agency. "These three projects allow us to evaluate the Range Extender's various possibilities. As with the C30 Electric and V60 Plug-in Hybrid, the goal is to make the cars exceptionally CO2-lean without compromising on customer requirements such as comfort, driving pleasure and practicality," explains Derek Crabb. Για να αναζωογονησουμε ενα ξεχασμενω τοπικ, αν και οπως παν τα πραγματα θα το χρησιμοποιουμε ολο και ποιο πολυ! Η Volvo ετοιμάζει το πρώτο ηλεκτρικό μοντέλο της!